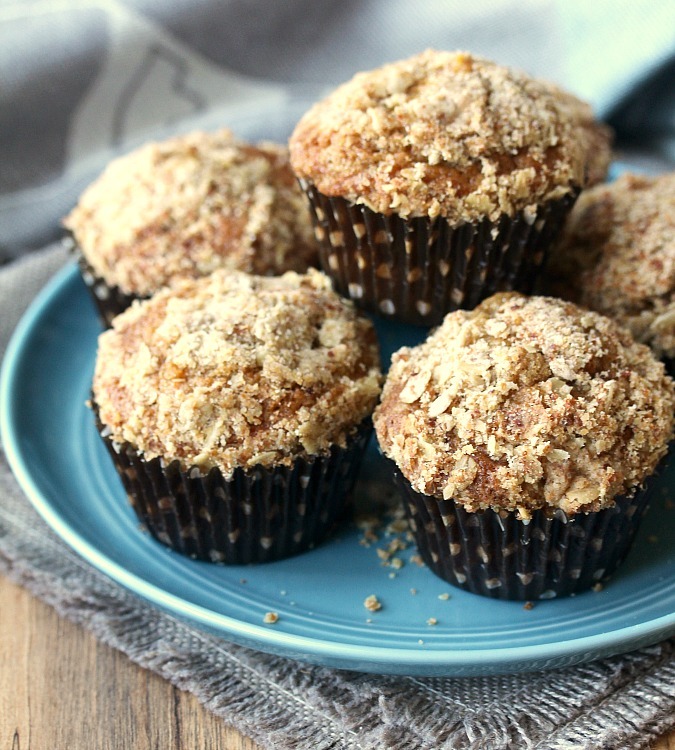 These Bouchon Bakery Style Carrot Muffins are flavored with cinnamon, vanilla, and topped with an oat, wheat germ, and vanilla streusel. These Bouchon Bakery Carrot Muffins are delicious for breakfast, for a coffee break, or an afternoon snack. They would also be wonderful for an Easter brunch. Note that these carrot muffins bear no resemblance to carrot cake. They have a light and delicate cinnamon-y flavor and are not the least bit dense. There are nearly two cups of finely shredded carrots in these, which add sweetness and moisture to the muffins. 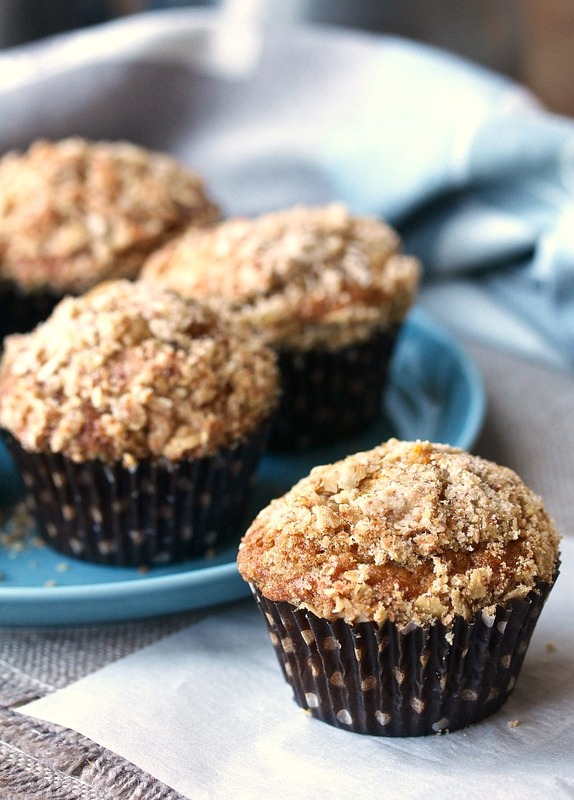 The key to making the sweetest carrot muffins is using the best carrots you can find. I recommend the carrots that come in bunches and still have their tops on them. The skinnier the better. It's worth it. 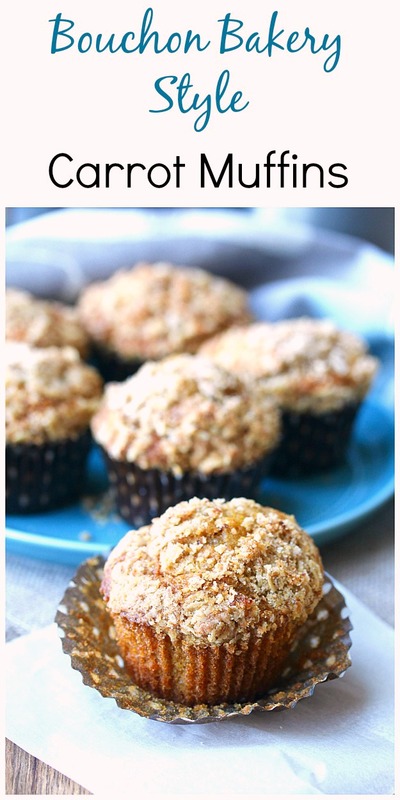 You will also need to build in some extra time to make these muffins. After mixing the batter, you will need to refrigerate it overnight. I often learn this the hard way, in the middle of trying a new recipe that I want to serve that day (when will I learn to read the entire recipe all the way through?)! I used a stand mixer to mix the batter, but a hand mixer or a large balloon whisk will work too. This muffin recipe has been slightly adapted from the amazing book, Bouchon Bakery: The Thomas Keller Library. This book is a huge tome of exacting baking formulas, and includes recipes for cookies, muffins, cakes, tarts, pastries, and breads. The recipes are as precise as Thomas Keller himself, which is why I was a little worried when I adapted this recipe for six jumbo muffins to 10 regular sized muffins (when I realized I didn't own a jumbo sized muffin pan in the middle of making these muffins). If you make these carrot muffins in a jumbo muffin pan, preheat the oven to 425 degrees F. Once you've place the pan in the oven, lower the temperature to 325 degrees F, and bake for about 40 minutes. For more information about Thomas Keller and the Bouchon Bakery, as well as his Easter recipes (including this one), you can read more on NPR: The Salt. P.S. In true Thomas Keller style, this recipe calls for 80 grams of eggs. A large egg is usually 50 grams. I whisked two eggs together, and then poured the eggs into a bowl on a scale until I had 80 grams. The remainder was approximately 1 1/2 tablespoons. 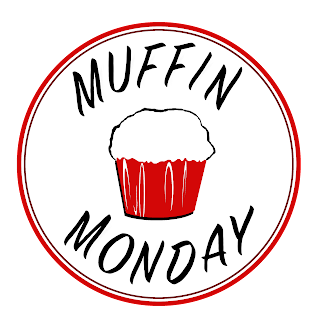 Be sure to check out the rest of the Muffin Monday bakers' contributions after the recipe. Prepare the batter the night before, and bake the muffins the next morning. Place the flour into a medium bowl, and sift in the baking soda, baking powder, and cinnamon. Whisk in the salt. In the bowl of a stand mixer, add the sugar and the oil, and mix using the whisk attachment on low for one minute. Add the vanilla, and mix for 30 seconds. Scrape the bowl, and add the eggs. Mix on low for 1 minute. Add the flour mixture in two additions, mixing on low for 15 seconds each. Remove the bowl from the mixer, stir to incorporate any dry ingredients, and stir in the shredded carrots. Transfer the ingredients to a medium bowl, cover with plastic wrap, and refrigerate over night, and up to 36 hours. At baking time, preheat the oven to 375 degrees F., and line a 12 cup muffin tin with 10 muffin papers, and spray them lightly with spray oil. Divide the batter among the 10 liners, and add some water to the other two muffin cavities. 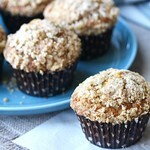 Sprinkle each muffin with the streusel, and gently press it into the batter. Bake the muffins for 25 minutes, until a toothpick inserted in the center comes out clean. Cool in the pan for five minutes on a wire rack, and then remove the muffins from the pan and cool on a wire rack. Store leftover muffins in an airtight container. Whisk together all of the ingredients except the vanilla and butter in the bowl of a stand mixer. Add the vanilla and butter, and beat until the butter is incorporated and the mixture is mealy. Transfer to a small bowl, cover, and refrigerate for at least 2 hours, and up to two days. Use straight from the refrigerator. You are amazing! I'd be all 'eff you and your 80 grams of eggs'! But I do think these are the perfect way to enjoy those tender sweet farm share carrots. Ha ha! I'm not sure what damage the extra 20 grams would cause, but I do like justifying the scale. I'm with Kirsten. I admire your patience and perseverance, Karen. And, in the end, the muffins are gorgeous so you are amply rewarded! Thank you Stacy! They were very tasty too. Funny, right? Very Thomas Keller. These muffins are calling my name, they look so good, Karen! That oat topping looks so good!